Did Nike Troll Steph Curry With This Kyrie Irving Ad? Nike's rolling out a campaign for the start of the 2016-17 NBA season called "Come Out of Nowhere" that commends gutsy plays and conquering insurmountable odds. Following up on its video for LeBron James referencing "The Block," the brand dropped the below, a stylized image of Kyrie Irving taking a shot in the Finals despite the defensive efforts of the Warriors. 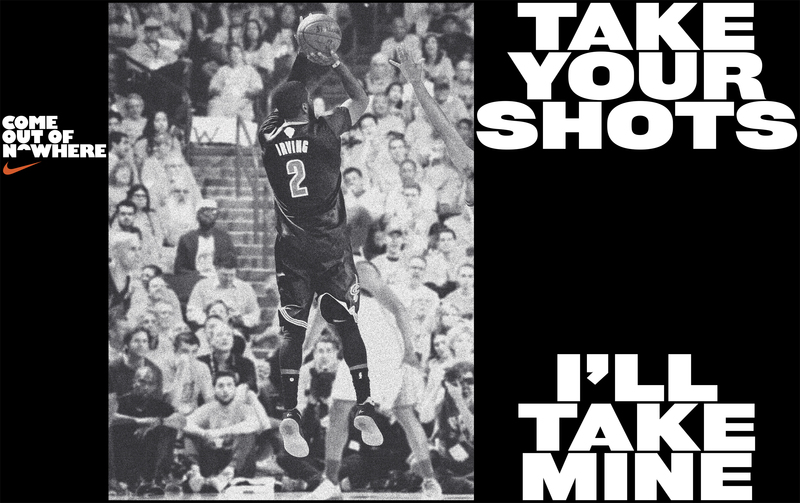 Who exactly is Irving challenging with "Take Your Shots"? One possible answer is celebrated shooter Steph Curry, whose arm may or may not be creeping in from the right side of the frame. The ad doesn't quite call out Curry directly, but just might be the closest Nike will get to doing so. Under Armour, for its part, isn't forgetting the disappointment that marked the end of Curry's season. This week, the brand released a spot where Curry addresses his team's blown 3-1 lead in the Finals.